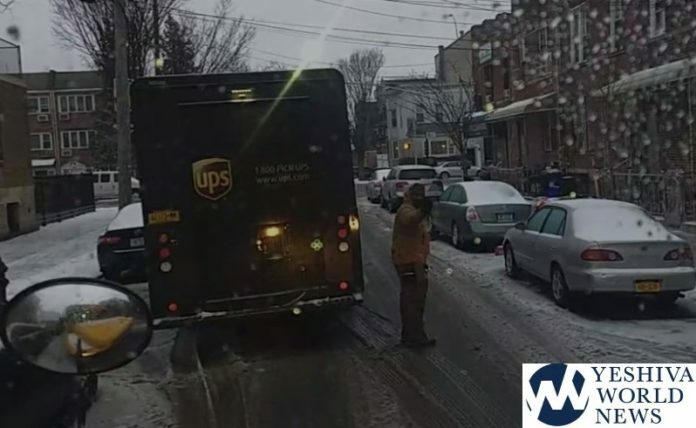 Just a few hours after a UPS driver in Boro Park refused to move his truck for an ambulance – and threatened the man who took the video with a lawsuit, video of another UPS incident surfaced. This video was taken on 58th Street between 12th and 13th Avenues, by a bus driver who sat patiently behind a UPS truck that had blocked the street as he made deliveries on Tuesday. Eventually, the driver walks back to his truck, and notices that the school bus driver was recording him. Instead of getting in his truck and driving away, he walks over to confront the bus driver. BUS: “Because you are obstructing traffic here for over a minute”, the bus driver responds. UPS: “You are not supposed to take my video like that”, the UPS driver says. Meanwhile, the viewer will hear the long line of cars backed up behind the bus honking their horns, as the packed bus of children are forced to wait. But to delay things even longer, the insensitive UPS driver spends an extra few seconds to take a photo of the licence plate of the bus – as if he did anything wrong. Stop playing the victim here!! Yes it may be a pain to wait for the ups guy for a “whole ” 2 minutes but it’s okay for the heimishe bus drivers to wait for the mamelech to get her act together and come out after 45 seconds of the bus beeping and the conversation that follows. Or when Satmar busses on 59th street off 13th avenue decide to pick up the students and not bother to close off the street and everyone behind has to wait 15 minutes for the kinderlich to load. Or the lumber yard on 13th ave between 59th and 60th street that thinks that one lane is their personal parking lot thus causing traffic snafus. Give me a break, this chazerei isn’t only with UPS but out heimeshe community are just as equal offenders. Cuz when it’s someone catching a minyan or just running in for “איין מינוט” it’s ok, but when it’s UPS…. Stop with the double standard! You cant gave it both ways! Isn’t opening the main door of the bus to strangers against safety rules, should of had the guy come around to the window. Just saying…. The other one is shocking, this one is a non story. Bichlal, the sheigatz waved to the driver in a friendly manner before realizing that the driver was videoing him. No comparison to the ambulance incident. School busses also keep people waiting constantly, often unnecessarily i.e. when they leave their lights blinking waiting for a student who for all we know is still finishing her Cheerios by her kitchen table. If everyone would be a little more empathetic, traffic would much smoother. Chill out, YWN. If you cry wolf too many times, nobody’s going to hear you when there’s really something to talk about. The other video was a story. This one is not. I sense a cultural issue here that needs rectification. Since when is UPS some civil agency or public works department with free reign to shut down streets for any period of time? School buses have those flashing lights, and yes, by law, you must stop! Police cars also have special rights that UPS drivers do not. Nor does FedEx drivers. Pizza delivery drivers, I assume, are subject to the same standard as a UPS driver. The only difference between them? One is unionized. What we’re left with? A frustrated group of drivers who are given impossible jobs. But, the UPS guy crosses the line by not ignoring it and moving on. He’s not that special, and you people and enabling this unofficial special class nonsense. With that said look at the ambulance company responding to a “emergency” bunch of buffs trying to beat maimonides to the scene. Lol hakavid to east midwood but no need to cause headlines school buses in borough park at 830 am or 3pm do a lot worse.